An antenna approximately one-half wavelength long, split at its electrical center for connection to a transmission line whose radiation pattern has a maximum at right angles to the antenna. Also known as doublet antenna; half-wave dipole. i. An antenna system composed of two, separated, electrically equal elements. ii. Radiators, usually fed in the center, that produce a maximum of radiation in the plane normal to its axis. The length required for efficient radiation is a function of the frequency of the radiated wave. 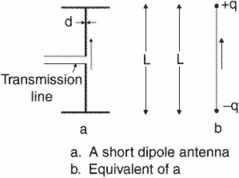 Meaning "two poles," a dipole antenna is the simplest type of antenna, consisting of an electrically conducting wire or rod one half the length of the maximum desired wavelength. The wire or rod is split at the center with an insulator. Each end at the center is connected to the feed line, typically via a balun to a coaxial cable (see balun).